SBBTI students and graduates enlighten us about how working in the Spa setting has been beneficial toward their growth and development as therapists. "Winner for the July is Paul!" Congratulations, Paul!! Even though you are new to our team, we already know that you are one of the hardest workers here and your work is highly appreciated. Your positive attitude couples with your consistent striving to help others is unbeatable. Whenever you have some extra time you are always contributing to make our spa a better work place. You're the epitome of hardworking, and serve as a role model for all of us." We are so proud of Paul and all his efforts towards healing those around him! If you would like to get into contact with Paul, please visit our Find Local Therapist Page. 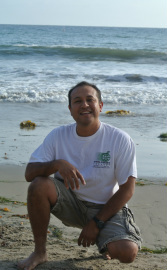 Kaleo Naea has been a professional body worker now for 13 years, with a lifetime of experience in massage. He has enjoyed working in many of the areas local spas. He currently runs a thriving private practice with his specialty being deep Myofascial Release blended with some Swedish style strokes to provide the essential relief needed, by many top athletes. "I became interested in massage when I was fourteen. I was into power lifting. I had suffered an injury and found it amazing that I was able to get back to the gym so quickly with massage. I attended a massage class with one of my older friends, but didn't pursue it as a career until later. I have always been health conscious and as I began my official training in massage, my interest in health and well-being grew to include other holistic health practices. This passion and dedication to health and happiness comes through in my work and in my presence with each client. Originally from Kaua'i, I moved to Santa Barbara in 1987 and have enjoyed life here and made it my home. I live up on the Santa Barbara foothills (Los Padres National Forest) and I treasure each day. 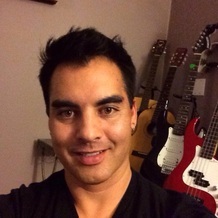 Hawaiian music is my other passion, I play traditional and slack-key guitar and I sing in Hawaiian too! I also like to go hot springs hunting, travel, and cook organic food. I learned the ancient wisdom and healing techniques of HUNA from my uncle, a Kahuna on Kauai. From my travels I have continued to learn new techniques that I have integrated and developed into a massage that is holistically healing to my clients and myself. My massage in an eclectic blend of styles customized to nourish and bring balance to your unique body. I am a dedicated facilitator of healing, and I love what I do, which translates through my touch and my devotion to the art of massage. I find that the deep Myofascial work feels entirely different than receiving a regular Swedish massage. It depends on the level you want to go with it and the athletes I work with really appreciate it. I have been lucky to have such great clients. I have worked for 9 years with Gold medalists for beach volleyball, Todd Rogers and Phil Dalhausser. I have also worked with local yogi's and many top athletes including an MVP baseball player, and a few other MBA stars. Establishing regular weekly clients has been a huge part of my success." Kaleo has worked in several local spa's and commented on how his experience at Massage Envy has helped him to shape and boost his private practice. "In addition to the many conveniences of working for someone, I found that working at Massage Envy was great training ground for me to brush up on and perfect my skills. Working in the Spa gives you exposure to many different situations and body types. The more clients you have the more you learn. Being in the spa environment also helps you to remember to apply the small details and professionalism that make each massage special. It makes preparation easy. People that go to the Spa like the environment, they feel like they can truly relax and because of that, they are more open to receive the healing." Working at Massage Envy was also what led me to boost my skills by bringing my awareness to the CAMTC certification. I had been working in my private practice like many other local therapists I wasn't really informed. I started working there and it prompted me to return to school. I graduated from SBBTI in May 2001. I still take classes once in a while. It's great to keep learning new things. I feel like I'm all set up for at least another 20-30 years of massage business success! "I really like working at Massage Envy. It's a great place to get started and really hone in on your skills. I began working in Goleta, Nov. 2013 as an Esthetician. Now I am in massage school and will also be doing massage there soon as well. I like the company and the fact that it's corporate. There are many perks including insurance, good tips, you don't need a costly city business license, and don't need to search for your own clients. You get to build your clientele without doing the marketing work. Many of my friends that work there have their own private practices on the side. I work with a lot of nice people, even the bosses are great. I feel Massage Envy has the best interests of their employees in mind. The environment is laid back and it's fun. The staff is great and they are very accommodating with schedule changes. It's a stress free way to start a career in massage. If I had advice for students looking for spa employment I would highly recommend taking Spa Deep Tissue with Jordan Terry. It is the most requested style of massage at the Spa; that and Swedish, but even those that want Swedish also are looking for some Deep Tissue work. I found the deep tissue class to be valuable and Jordan is great!" What's possible with spa employment? "I greatly appreciate the support, encouragement, professional growth and ethics that Massage Envy helps promote in their therapists. Working for Massage Envy, I have the convenience of a set schedule around my children's needs. I have regular booked clients, all supplies provided and time off when I am with my family. The Staff at Massage Envy are very friendly and supportive. I have benefited from their scholarship program which has given me the opportunity to continue growing as a therapist. This level of support makes it so much easier to focus with clients and to grow as a therapist. I graduated from SBBTI in 1998, At the time I was running a preschool. I started out offering massage to my childcare community. I gave massage to my preschool parents to help them ground and nurture themselves so that they could also nurture their children. From that initial outreach, I built a part time practice for 13 years. I've been with Massage Envy the last year and a half. Massage is my main income now in support of my three children. The affordability and incentives makes regular bodywork possible for Massage Envy clients. The real commitment that Massage Envy promotes to their members to receive regular sessions- increases their level of health and well- being. That is what is important to me, to see my clients get regular bodywork because they can afford it, rather than an occasional session at a high end spa. Whether I am seeing established clients or new member clients, I enjoy facilitating their pathway of healing. " 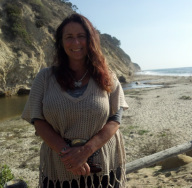 I am a former student from the Santa Barbara Body Therapy Institute. I graduated in 2011 from the 550 program and am now a CMT. Today I feel proud to be one of the top and most requested therapists from the Massage Green Spa team located on the Mesa in Santa Barbara California. Massage Green has offered me great opportunities to keep learning, practicing and providing all the knowledge obtained at SBBTI from all of my intuitive and experienced teachers. I especially like to practice “Tui Na” which I learned from Eric Hudson about the manipulation of the human body and Chi energy flow through the meridians. I feel passionate and committed to continue to do what I really like. I do my job with joy, optimism and always with a positive attitude. I enjoy helping my clients feel better, and feel I can provide overall and optimum well- being results. My clients at Massage Green have taught me how to listen to bodies, work directly with their needs, and use the hour of massage wisely so I can reach the results they are paying for. Working efficiently with my client’s needs brings me great satisfaction. It’s good to know that what I chose to do in my life can have a positive impact on my client’s health, and can change their mental state as well as go home painless. On April 2014, I will be taking an Advanced Bodywork deep tissue class at Esalen institute with one of the most and well-recognized massage professors, Jessica Fagan, where I expect to revisit what I know and keep learning new skills. I feel fortunate and lucky to work for such an amazing and great spa that offers an environmental consciousness and uses all eco-friendly products. And lastly, by working a full time job at one of the local and healthy nutrition grocery stores, Lazy Acres; I have taken awesome advantage of the good deals on all of the multivitamins, minerals, nutritious food and organically grown locally produce helps me to maintain my health and stay in good shape. I am appreciative to be surrounded by healthy practices in all directions. I feel Energized, body wise and ready to go to work. "I work at Massage Envy and also have my own massage practice. I get to work on a lot of clients, a lot of bodies...well over a thousand a year. I like working at Massage Envy because the owners are really nice- Jeff and Christina, and they are also the managers. It makes for an easy workplace....It's like, not working. They send me a lot of clients who need deeper bodywork ... I mostly work with athletes and I enjoy practicing many types of massage. I see about 25 clients at Massage Envy per week and around 5 to 10 additional clients in my private practice. Building my clientele has taken about 3 years. I work on mostly athletes- swimmers, tri-athletes, martial artists, volleyball players, surfers, bikers and runners. At Massage Envy I am making $27-$37/hr with tips. For my private practice, I charge the general rate of $70/hr during the week and $100/hr on weekends. This career gives me the flexibility to enjoy my hobbies. I just started making fine art again and have completed 2/3rds of a large body of mixed media paintings...some up to eight feet tall, with the theme of water. When I complete them I plan to have my first fine art show at an art gallery in Los Angeles. I love this work because it's not like working at all. Feeling relaxed all day is a big benefit of doing this kind work. Another is the social interaction, and being able to help a lot of nice people. "I have been happily employed at Massage Envy since 2007. We have an awesome staff of supportive massage therapists and a well qualified management team that genuinely cares about staff and clients. I generally work five to six hour shifts that include every weekend and two week days. I don't have a private practice. The clients that I see at Massage Envy are appreciative of their relaxed and flexible muscles at the end of a massage. Clients also appreciate the nuances of the Massage Envy environment. Massage table warmers, warm blankets, air conditioning, soothing music, filtered drinking water and warm non caffeinated tea are available to all the guests. For a small fee clients can add services such as Aromatherapy. Deep Muscle Therapy (DMT) topical application and a Sugar Foot Scrub. Guests seem to receive value from these affordable services. SBBTI is the perfect massage school atmosphere for me. At SBBTI I have experienced knowledgeable teachers and students. I have learned Myofascial Release, Trigger Point therapy, and Spa Deep Tissue so far. Oh and did I mention that Massage Envy will reimburse me $100.00 per year for continuing massage therapy education?"